If it is important for your new commercial building to be environmentally friendly, or if you just want a roof that is as beautiful as it is durable, you’ll want to talk to Golden West Exteriors about Euroshield. We’ve been installing new roofs and re-roofing buildings for some of Alberta’s top contractors and commercial builders for more than a decade. You aren’t going to find a more reliable, professional, respected, or experienced commercial roofing contractor. Euroshield is made of up to 95 percent recycled material, and any shingle trimmings left over after your roof is complete can be recycled back into the manufacturing process. Even though Euroshield tiles are made up of about 70 percent recycled rubber tires, you’d never know it by looking at them. They are as beautiful as they are environmentally friendly. And, here’s something you’re not going to find anywhere else. The product is also local. More than 53 percent of the recycled rubber used by Alberta manufacturers in 2015 was used to manufacture Euroshield roofing tiles. Whether you are seeking LEED certification for a new structure, or a remodeled commercial building, talk to us about Euroshield. They are recognized by LEED by the green building rating system, and can help you achieve your silver, gold, or platinum LEED rating. How your building looks is a reflection on your business. The wrong roof can make a great building look pretty bad. These high-quality, weather-resistant shingles mimic the look of taper-sawn wood, traditional wood shake, and expensive slate shingles. You can get the look you want without wrecking your budget or compromising on durability. Another thing to consider when choosing your roof shingles is their weight. 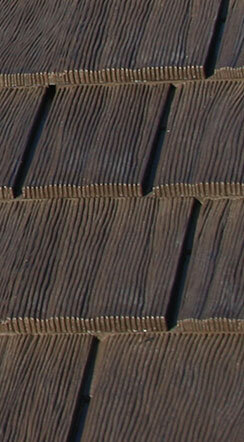 Are you willing to pay for the extra structural reinforcements you’ll need to support a slate roof? If not, Euroshield is the way to go. Given how well these tiles stand up to the elements, it is easy to forget that they’re made of recycled rubber and are extremely lightweight. Give us a call. Our commercial roofing team is here to work with you to choose the best roof for your commercial building. And, because we’ve been at this for more than a decade in Alberta, you can be sure that both the quality of our construction and the quality of our project management are unmatched. There’s a reason so many of Alberta’s top builders and contractors work with us for all of their commercial building projects. Give us a call to find out for yourself.